Last year at CES Victorinox surprised everyone with a one terabyte flash drive that the company estimated would sell for almost $3,000. It sounded too good to be true, and given there's been no sign of it since last January, it apparently was. 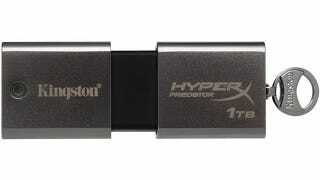 So can Kingston fill the void left in our hearts with its new HyperX Predator one terabyte USB 3 flash drive? Let's hope so.